To investigate the vertical bearing behavior of manually excavated large diameter belled concrete piles (LDBCPs), field loading tests were performed on a total of 16 LDBCPs, ranging from 0.8 to 3.5 m in base diameter from 6.1 to 18.0 m in embedment length. The end bearing stratum is sand and gravel. 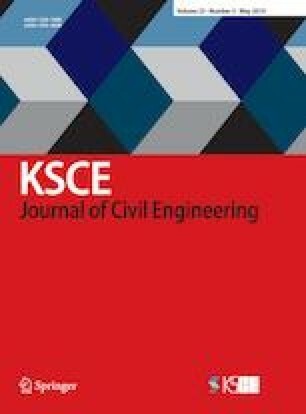 The influence of pile dimensions (i.e., size of enlarged base D, embedment length L, and length-to-diameter ratio L/D) on the vertical bearing behavior of a belled pile is presented and discussed. Comparison is also made of the vertical bearing behavior of a belled pile and of a conventional straight pile under otherwise similar conditions. The results indicate that: 1) The vertical bearing capacity of a belled pile is significantly greater than that of a conventional straight pile provided the debris at the bottom of a belled pile is properly removed; 2) over 65% of the vertical bearing capacity for a belled pile is attributed to the tip resistance (Qe); 3) compared to the contribution of pile length L, increasing enlarged base D is a more effective way to increase the vertical ultimate bearing capacity of a belled pile (Qu); 4) the optimum length-to-enlarged base ratio (L/D) for belled piles to achieve maximum vertical bearing capacity is around 3.2.